Here is an interesting group of Trilliums, on the left is T. erectum album with the dark ovary; in the middle is T. flexipes, the Kentucky form and on the right is a seedling that I presume is a hybrid between these two. I must admit that I find the nomenclature of some of the trilliums very confusing and I just cannot separate some of the so called different species from the plants we have - the one thing I am sure about is I love them and grow as many as we can get. 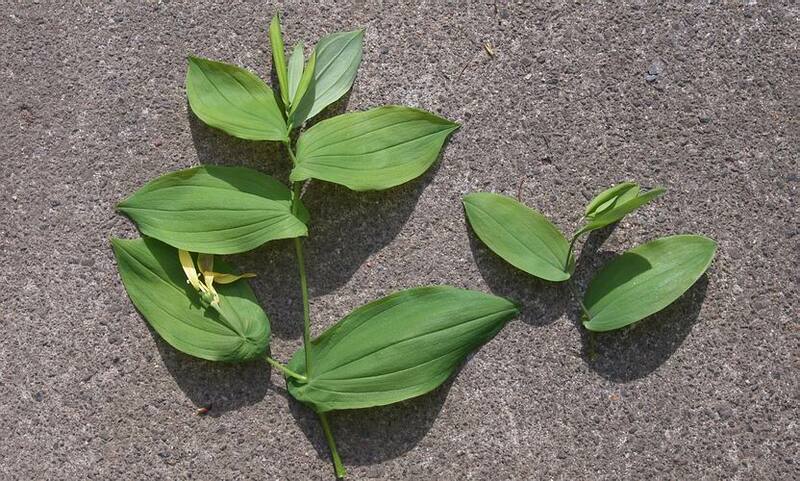 There was some confusion about Uvularia being discussed in the forum recently mostly between Uvularia grandiflora and U. perfoliata. Above is a picture of one clump of Uvularia grandiflora and clump is the important word because in the garden all forms of U. grandiflorum form dense clumps - this is the darkest yellow form we have and it is the colour of a good fresh egg yolk. 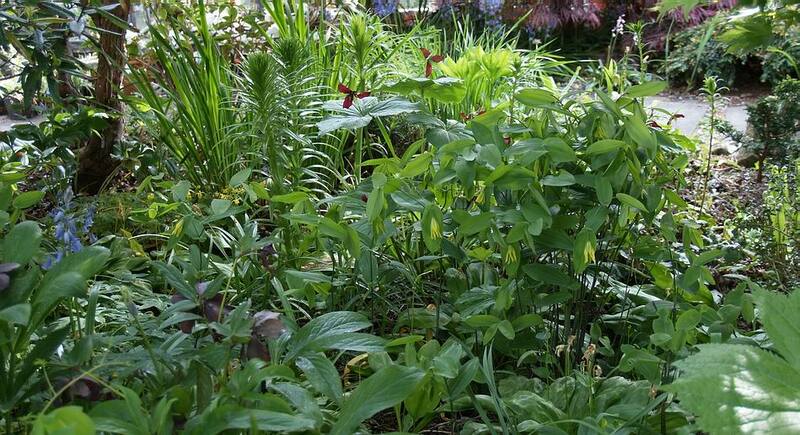 Running across this picture you can see Uvularia perfoliata and running is the key word as U. perfoliata, rather than making dense clumps, forms a line of plants radiating from the original. Comparing the flowers the first thing to notice is the difference in size ( that is a millimetre scale at the bottom). 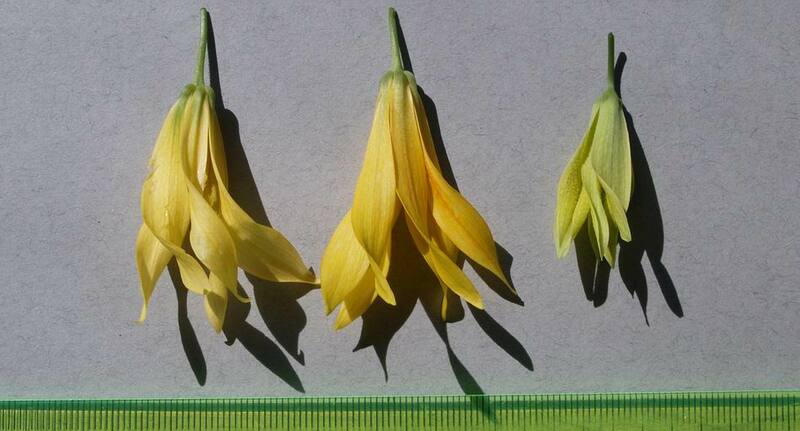 The two flowers on the left are the two colour forms we grow of Uvularia grandiflora and the much smaller flower on the right is U. When we compare the leaves (grandiflora on the left) there are also subtle differences mostly in size and shape but both species have perfoliate leaves which describes how the stem comes through the leaf. If you look at the base of the leaves they appear to rap around the stem. 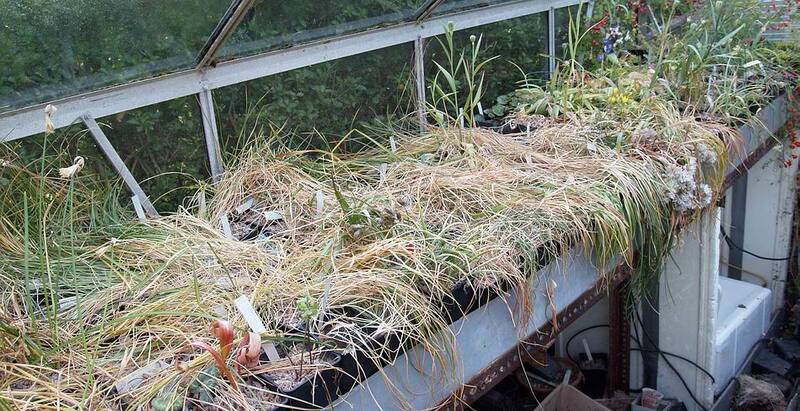 Just compare this scene of the bulb house with the one I showed a couple of weeks ago and you will see that the bulbs are retreating into their dormancy nicely this year. They have had a good growth period and with the warm week we had recently they are shutting down for the summer. While checking on the bulbs I have discovered the seed pods on some of the crocuses are ripe and ready to shed their seed - this is Crocus laevigatus. 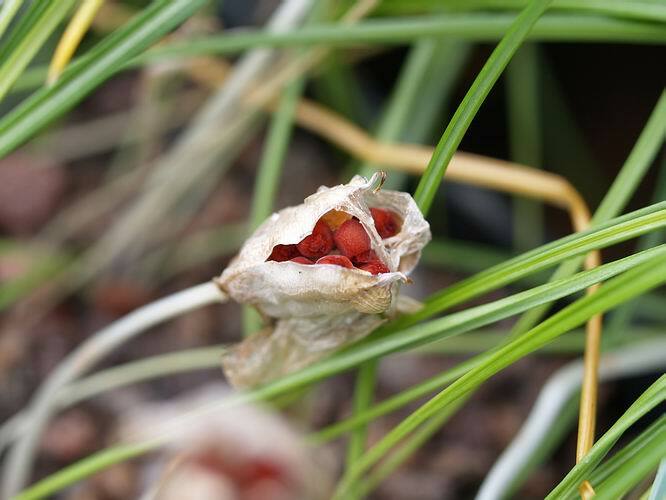 Crocus seed pods are under ground for most of the time and only push up when the seed is ready to be shed and this extension of the stem can happen remarkably quickly. Some crocus do not push their seed pods up at all and I only find them when I remove the gravel to repot the corms. I do not know if they remain under ground in the wild or if this is just what they do in our growing conditions. 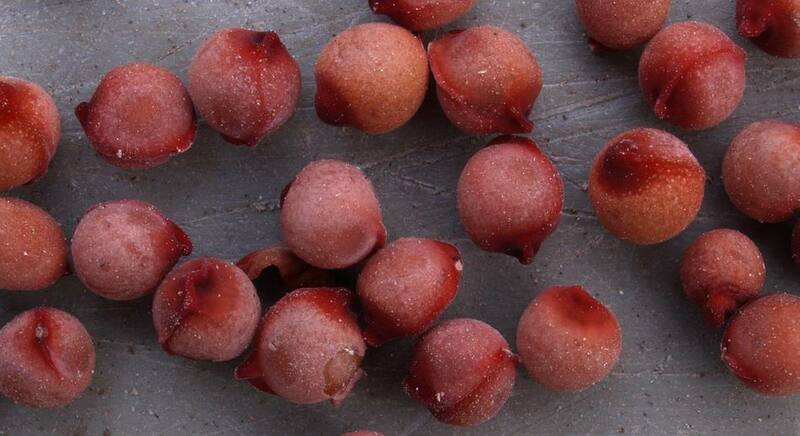 Here is a detail of some of the beautiful red velvety-textured seeds - they are fascinating when they are first shed. 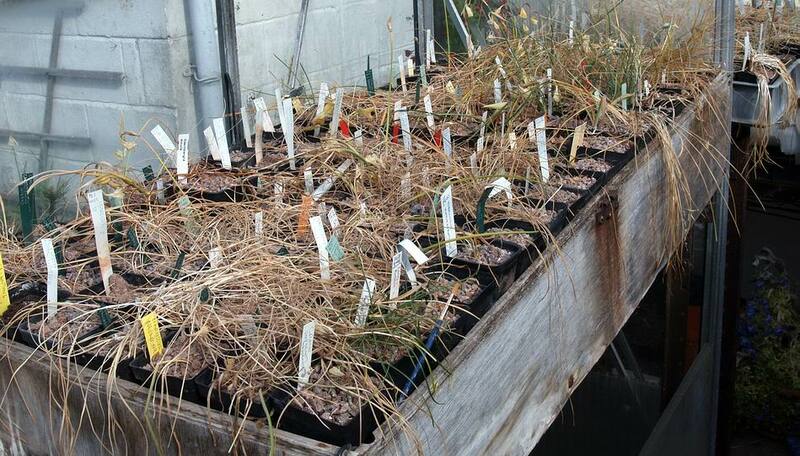 To keep them over the summer until I sow them in August/September I will store them in dry sand in plastic bags. 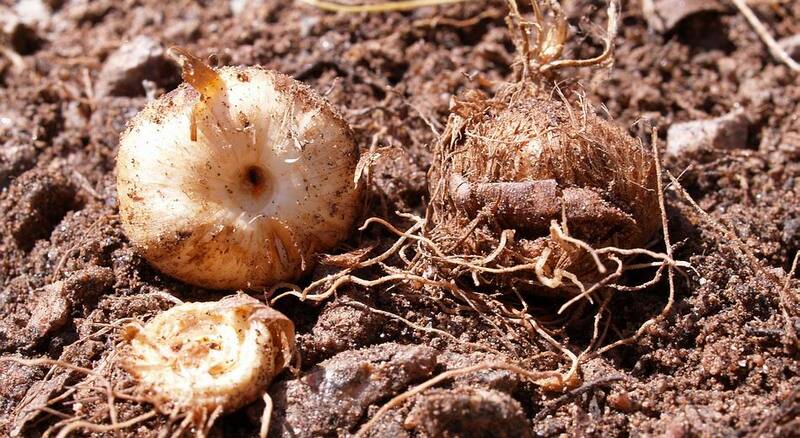 mise the chances of them rotting and infecting the new corms. 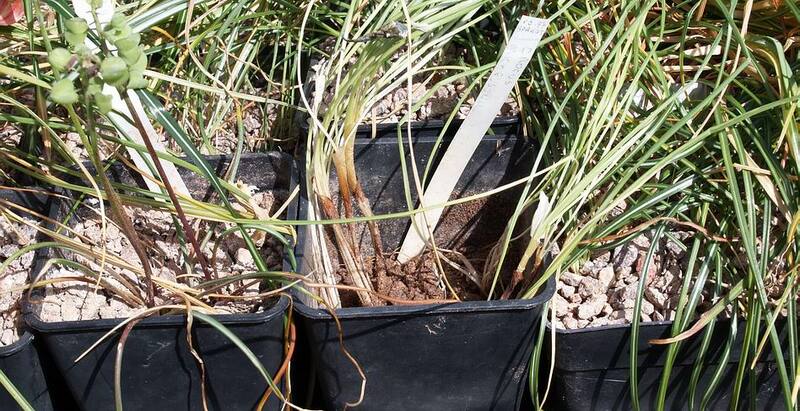 Another method I am employing is to tip some of the compost out of the pots of the dryland crocus like this pot of Crocus michelsonii seedlings to help the compost dry out quicker now the leaves are turning yellow. The smaller 7 and 8 cm pots in the prop house plunge hold such a small volume of compost that they dry out without any intervention from me. 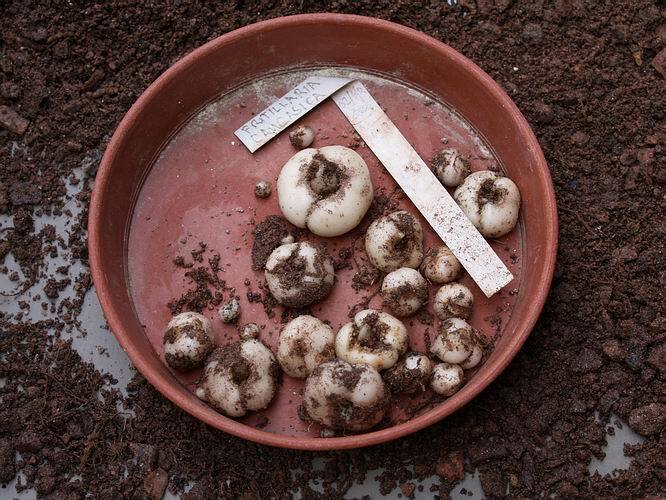 I am also employing the same methods with some of the frits that I know to be susceptible to rotting in wet compost at this time of year like these Fritillaria caucasica bulbs. Beautiful clean healthy bulbs like this can quickly be attacked by wet rots if the compost is too moist so I am tipping them out letting the compost dry out a bit by spreading it thinly on a tray then place the bulbs back into the drier compost until I repot them later in the summer. Surely this is a lot of extra work I hear you say but whoever said that growing bulbs was easy and not a lot of work -" you only gets back what you put in" is a good saying. 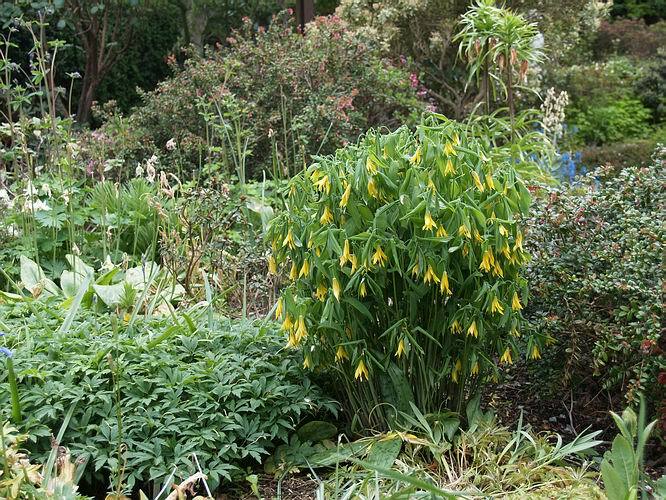 You may remember that I cut the top off a Fritillaria sewerzoii bulb, as described by Janis Ruksans, at re-potting time last summer and here is the result. The bottom of the bulb grew on and flowered as normal while the ring cut from the top produced a number of offsets. I removed the offsets and was about to discard the old ring cut off the top when I decided to break it up and I discovered a few more small offsets completely hidden inside the rings. This is a good way of getting vegetative increase from a frit bulb that does not normally form offsets and I will use it again and may be get better results. I also repotted some of the tulips that I bought as growing plants at some of this year's spring shows, I showed them in bulb log 12 - to be honest I could not wait to see these bulbs. This is the bulb of Tulipa cretica and I was interested to see that as well as the main bulb being replaced with a nice new one the plant also formed a second bulb on the end of a short stolon. Tulipa stapfii has increased well producing lots of offsets as well as a flowering sized bulb all of which I removed from the remains of the old bulb before re-potting them. 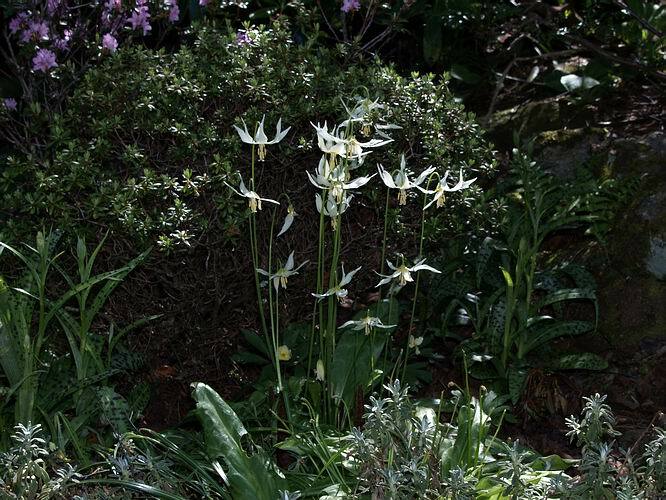 This is consistently the last of the erythroniums to flower for me - even later than E. montanum- it is a form of Erythronium oregonum it is very welcome as it extends the Erythronium flowering season by another two weeks.